Apple announced a new iPod yesterday - the iPod Touch. As you can see, it looks a lot like the iPhone, because essentially that's exactly what it is: an iPhone without the phone, camera and email bits. It's taken multimedia players to the next level with built in WiFi support so you can browse the internet whilst listening to your tunes. You can also now download tracks from the iTunes store directly to the iPod, so in theory you'll never need a computer to use the iPod Touch. And look ma, no buttons, thanks to it's fancy touch sensitive screen (should I say scratch trap?) . Now everybody say "Oooooooo, I want one". I mostly listen to my iPod in the car. Having a fancy touch screen and videos is a bit of a waste when it'll spend it's life in the cubby hole. Actually, scratch that - I'll just leave my current one in the cubby hole. I like to watch movies and videos on big screens, so this functionality would probably be a bit of a waste. 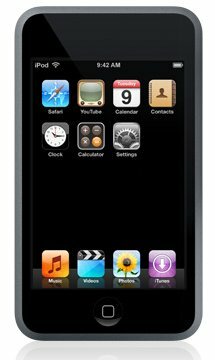 The largest iPod Touch only comes with 16Gb of storage. My Gen 2 iPod has 15Gb. This should hold a fair amount of music and videos, but on a long holiday, you'll soon get bored of your small selection. What's more, as it's now got a web browser, all that web surfing is going to take up space as the browser caches more and more as you use it. Most importantly, Apple will probably drop the price in about 2 months time :-) Along with all the iPod changes they announced yesterday, they also announced a drop in price in the top of the range iPhone by a whopping $200 - I bet there are a lot of pissed off gadget freaks out there. This makes me think - do you think Apple plan on filling the $599 gap that the old iPhone held with a new iPhone that will actually be of use to people, ie has 3G support? Anyway, I think I'll be holding off on getting one of these. I've got much more important things to spend my money on at the moment, but if Santa Clause wants to pop one in my stocking this Christmas, I won't mind. Come to think of it, if Santa Clause could please hurry up with those flights and tickets I asked for a while back, I'd really appreciate it; the T20 World Cup starts next week.